It’s summer, and WELSTech kicks off three months of lighter shows focused on three very practical topics sure to help some aspect of your ministry: mobile, security and publishing. Sallie finds a tool that will help you analyze your word choice habits, while Martin resurrects one of his favorite pieces of tech that anybody who does presentations might want to take a look at. Plus, there’s a brand new photo challenge with a summer “R&R” focus. Here he is folks – Side by side at the Center for Mission and Ministry, Martin and Sallie look ahead to not one but three exciting how-to summer series planned for WELSTech. Tune in to WELSTech this week for edtech sunshine in the form of SRCTC Jason Schmidt. The discussion topic covers a variety of outdoor and rainy day tech ideas for educators including geocaching, astronomy and coding. This show also includes excited news for Chromebook users, summer training opportunities and a site for purchasing low-priced smartphones and tablets. Eeekk, a rat! – Martin and Sallie are joined by WELSTech’s SRCTC (Semi-Regular Classroom Technology Correspondent) Jason Schmidt, Tech Coordinator in the Bennington Public School District in the Omaha, NE area, for a discussion of outdoor and rainy day tech projects for the classroom. Enjoy this fun MLC Day video from Lakeside Lutheran High School, a new addition to the WELSTech Promo playlist. WELSTech has something for everyone on this community feedback episode. Topics include social media strategy, mobile photography, Google Apps for Education, church bulletins and more! 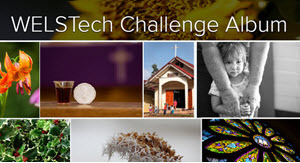 Martin and Sallie also share the latest news from TechSmith and Google, helpful tips on Excel and the Chrome browser and worship/bulletin artwork from WELS artists. The listeners speak – Martin and Sallie share recent WELSTech community feedback. This week Martin and Sallie finish up the WELSTech Project Management book project with a look at steps to close out a project to ensure future project’s success. We share all the details of the exciting season of synod school commencement and assignments which has arrived, plus Sallie shares, perhaps, the lengthiest pick of the week of all time – all about the fun Breakout EDU craze. Going retro – Martin and Sallie complete their DIY book effort this week with chapter 9 of With All Your Heart: Project Management For Churches, Christian Schools & Other Faith-Based Organizations. The chapter includes best practices for wrapping up a project to maximize success on future projects. Check out the new Google Slides Q&A feature on the WELSTech Product Demo Playlist on YouTube.